This is my Filipino/Basque grandfather Don Tirso de Irureta Goyena in his Willys-Overland with his Japanese chauffeur. 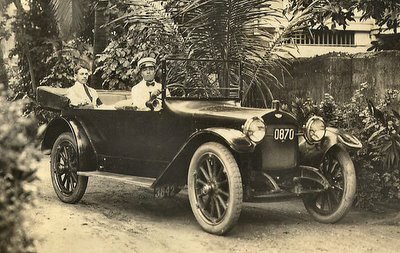 I know this photo was taken in 1912 because my mother told me it was the first Willys-Overland in Manila. It was that year that John North Willys renamed his company from Willys Overland Division to the Willys-Overland Motor Company. My grandfather was a lawyer and a writer in Spanish. Because of his defense (in the end for naught) of the Spanish language facing an onslaught by American English he was made a member of the Real Academia Española.